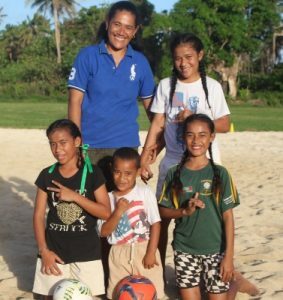 TongaFootball > News > Just Play programme > #ENDviolence against women and girls campaign! 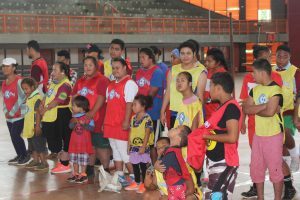 Just Play program in collaboration with Tonga Football marked the International Women’s by launching of #ENDviolence against women and girls to football coaches, referees, just play volunteers and representatives from football communities here in Tongatapu. This program was organised by the Just Play Project Manager Ms. Palu Úhatahi and her team to coincide with the International Women’s day theme, ‘’BE BOLD FOR CHANGE’’. However, in the Tonga Legislative Assembly, MP Akosita Havili Lavulavu is the only female representative in the house, and she was the guest of honour in today’s event. In her keynote speech, Lavulavu emphasized, ‘’I believe with no doubt that one of the best way in which we can combat violence is through being the role models for the players in our teams and also at home.’’ If we uphold a lifestyle demonstrating that violence is not acceptable, demonstrate love towards others, it will be something our young football players will learn from and will continue this positive chain to others that they will coach, mentor and teach down the line’’. To conclude her speech, she stated how she was moved to see everyone in the room were all in black to show our respect for the lost of our beloved Late Queen Mother! The first guest speaker, Inspector Linda Motuápuaka from the Ministry of Police which they are the department that deal directly to prevent violence against women and girls here in Tonga. First of all Motuápuaka affirmed of their call, is to enforce the Tongan law to every Tongan citizen. She also stressed out that Police Force are committed in trying to prevent violence against women and girls at home or where ever it may occurred. ‘’Learn this number by your heart, 922, if you come across any form of violence against women and girls, please dial 922 and we will come straight away,’’ urge Inspector Motuápuaka. Mr James Deane, first Secretary of the Australian High Commission’s office make a presentation of how the Government of Australia assist to make Endviolence to grow bigger and bigger. ‘’Sport is a wonderful way to promote the empowerment of women and girls, it’s fun and it’s challenging, but sport is also a powerful way to build connections, networks of support and communities that can work together to achieve a positive change in society,’’ he said. Before he conclude he did thank the Just Play and Tonga Football for the opportunity for him to address the occasion of International Women’s Day. ‘’It Is inspiring to see so many women and men around the world uniting to champion the equal rights and abilities of women and girls. Together we can make a difference and move towards a more inclusive, harmonious, safe and respectful society’’, added Deane. To conclude the launching of #ENDviolence program, Mr Lui Aho, TFA Secretary – General made the thank you remarks. He thanked the Guest of honour and all the guest speakers for availing their time to be here with us. He actually mentioned that their presence graces the occasion. 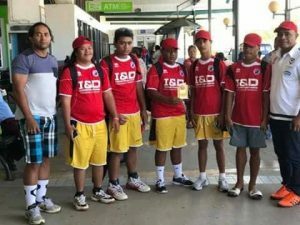 Tonga Football is forever grateful to Just Play program for their continuous support and always lending a helping hand to reach out to all football communities here in Tonga in addressing vital issues that the whole world is facing. #ENDviolence against women and girls! Next PostA mother’s shoe is way too Big!